Complete the look in your new bathroom with matching accessories. 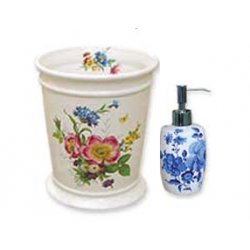 We can decorate on a wide range of items including wastebaskets, soap dispensers and faucets to co-ordinate with your decorated bathroom fixtures. 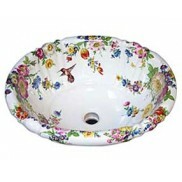 Check out the Decorated Accessories page to see more examples of our designs on different items. Most accessories are available in white only, but I do have some biscuit cups & dispensers as well as some bone dispensers, contact me for more info. If you are ordering a sink or multiple accessories, we may be able to include them in the same box and can probably give you a credit for some of the shipping. Please contact us for details, or just order your items, and I will get an exact shipping price and credit the difference back to your payment method. Decorated to match your fixture. 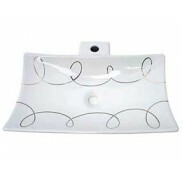 Traditional style rectangle shape soap dish. 5-3/8" wid.. Decorated to match your fixture. Larger volume than the other dispensers. 7-1/8" high (includ.. Decorated to match your fixture. Plain Dispenser 6-3/4" high including pumper, 2-1/2" diamete.. Round Dispenser 6-1/8" high including pumper, 3-3/4" diameter. Includes quality chrome pumper, as .. Decorated to match your fixture. 7-5/8" high x 2-1/4" diameter, including pumper. Comes .. Decorated to match your fixture. Single and double plates with various configurations available. C.. 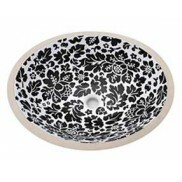 Most of our designs can be adapted to fit on various size tiles to coordinate with your fixtures. .. Decorated to match your fixture. Toilet Roll Holder. Holds one roll of toilet paper. 6" hi..
Order a sample tile in any design! If you need a sample for a client presentation or to make ..